I’ve taken procrastination to whole new levels on this one and for that I apologise. We showed the Synergistic Garden video by Emilia Hazelip at the May Seedy Sunday. Finally, I manage to get the notes up and a couple of links for your edification. I have to admit, I’ve become a little obsessed by these beautiful beds, all curved and mounded in sweeping lines. I also love the very way they are constructed, in sort of gentle sweeping movements. Due to my terrain I’m not able to do them at my house, so I’ve been eyeing up other people’s gardens to work on. 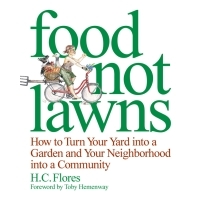 Lesson 5: The plant diversity of your lawn and gardens is directly correlated with your IQ. This goes without saying, and it explains why lawn monoculturalists are so difficult to teach.